New York, N.Y. – (RealEstateRama) — The Flatiron/23rd Street Partnership Business Improvement District (BID) today released its sixth annual Flatiron: Where Then Meets Now report showcasing the significant development and growth of the commercial and residential sectors in the district. 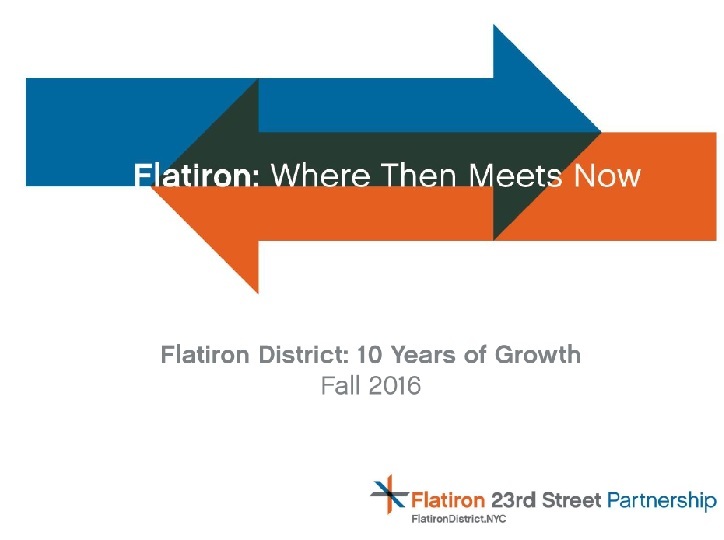 Subtitled “Flatiron District: 10 Years of Growth,” this year’s Flatiron: Where Then Meets Now report comprehensively describes the District’s 2016 vital statistics, and explores the district’s evolution since 2006, the year the BID was formed. The report is among a suite of publications from the BID that focuses on the real estate market in the neighborhood. The report is available at http://www.flatirondistrict.nyc/about-the-bid/reports-and-data. Bordered by 21st and 28th streets and Sixth and Third avenues, the BID boundaries cover more than 21 million square feet of commercial space and house approximately 4,600 commercial tenants and 570 ground-floor businesses. Since 2006, Flatiron has undergone a dramatic transformation into a safe, clean, and desirable neighborhood sought out by all types of people, businesses, industries, and interests. Included in the report’s review of the past decade are key statistics, such as the dramatic rise in asking rents for Class A and B office space in Flatiron, from $39.26 per square foot in 2006 to $69.94 in 3Q 2016. The 78% increase is greater than the increase over the same period in other nearby neighborhoods, including Midtown South, Midtown, and Hudson Square. Meanwhile, asking rents for rental units in the district have risen by 13.2% per unit since 2006, and developers have kept pace with increased demand from renters by adding over 920 new rental and condominium units during that period. •	The retail vacancy rate now stands at 5.3%, down from 6.6% a year ago. •	The Flatiron neighborhood’s residential population is 252,629. The population is projected to rise by 2.62% to 259,250 by 2020, and there are currently more than 700 residential units planned or under construction within BID boundaries. •	Demand for office space in the District remained high in 2016 with tenants from the technology, advertising, media, and information (TAMI) sectors accounting for 48.5% of office space lease signings. •	Companies that moved their headquarters into the District in 2016 include Sony, Grovo, Criteo, Taboola, Mission Capital Advisors, and Reorg Research. Meanwhile, Dropbox, Nielsen, and Winton Capital Management signed new leases in the District. •	There were several notable building transactions within BID boundaries this year, including the SL Green Realty Group selling a 40% stake in 11 Madison Avenue to PGIM Real Estate Partners for $480 million; and, China Orient buying a majority stake in the Kaufman Organization buildings at 19 West 24th Street, 13 West 27th Street, 45 West 27th Street, and 119-125 West 24th Street for $143 million. •	Dubbed “The Fitness District,” Flatiron is home to 47 fitness gyms and studios, a 15.8% increase since 2014. Fitness retailers Athleta, New Balance, Nike Running, Bandier, Sweaty Betty, and Tory Sport now call Flatiron home. The fitness and wellness categories represent more than 1 out of every 10 – or 10.3% – of all ground-floor businesses in the district. •	Flatiron is now home to more than 200 restaurants, bars, and quick and casual food establishments, representing 4 out of every 10 – or 41.4% – of Flatiron’s ground-floor businesses. So far in 2016, 20 restaurants have opened in the District, with another eight on the horizon. Restaurant growth has been particularly significant in the area now referred to as NoMad – the northwest section of the District. •	Flatiron is a destination for tourists and local visitors alike. Currently, there are 3,800 hotel rooms in and around the District – a 58.3% increase since 2011. Another 1,100 hotel rooms are in development. •	In 2015, ridership from Flatiron’s seven subway stations was 46.4 million, a 1.9% increase from 2014, and 2.63% of the city’s total ridership. Topping the increases was the N/R station at 23rd Street, with an 8.4% increase. •	NYC Bike Share added another station in Flatiron this year, for a total of 14 stations with 564 docking spaces. In May alone, 68,000 bike share trips originated from Flatiron docking spaces. •	Flatiron’s appeal to businesses, residents and tourists will continue to grow thanks to a slate of projects currently in progress: the City Light distinctive lighting project; new M23 Select Bus Services; DOT’s Sixth Avenue Complete Streets project with a parking protected bike lane and floating pedestrian islands; reconstruction of the Flatiron Public Plazas for permanent use; and, enhanced free WiFi connectivity.